There were no tears, except the tiny drops that escaped the eyes of KPAC Lalitha and Sona Nair. The flower vendor who had found a convenient spot beneath a shade tree on the Kerala University Senate Hall campus couldn’t sell a single rose petal. No one shouted ‘Murali will live through us’ when his mortal remains were brought to the Hall or taken out from there. Murali had abhorred tears. For, they were not manly. Flowers he had not loved. They reminded you of weak-hearted Romeos. And, sloganeering was taboo as he firmly believed in action, not speeches. But grief, frozen as an iceberg, pervaded the atmosphere like the dank odour of wilted marigold flowers. On the dais of the University Senate Hall, Murali slept like a king on a bed of flowers. He was draped with a red flag that reminded one of comrade TK in ‘Lal Salaam’. Beside his body sat comrades Kodiyeri Balakrishnan, M.A. Baby, P.K. Sreemathi, P.K. Gurudasan and K.P. Rajendran. Comrades V.S. Achuthananadan, Veliyam Bhargavan and Pinarayi Vijayan also had come to offer the red salute. ‘Neythukaran’; Sona Nair, Murali’s heroine in ‘Neythukaran’, and many of his close friends. An overwhelmed Murali had spoken for more than one-and-a-half hours that day. A speech that covered his childhood, his days as a stage actor, his association with Narendraprasad and the ups and downs in the film industry. The same Senate Hall witnessed the birth of Dhamani, the cultural association of Kerala University employees which was co-founded by Murali when he had served as a University employee. Dhamani’s volunteers were seen doing everything possible to help the police and the Cultural Department officials to complete the proceedings smoothly. Their banner and badges portrayed Murali as ‘Abhinayakalayile Neythukaran’. Hundreds had thronged the Senate Hall campus to pay homage to the great actor since morning. 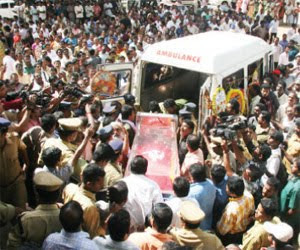 When his body finally reached the venue by 1.15 p.m., hundreds were waiting in queue. They patiently moved in three lines to reach the stage. Some offered a handful of flowers at his feet. Mammootty was there along with Innocent and Idavela Babu to pay last respects on behalf of AMMA. Adoor Gopalakrishnan, Madhu, Nedumudi Venu and Kavalam Narayana Panikkar were there. Actress Priyanka, actor-directors Venu Nagavally, Balachandra Menon and Madhupal, directors K. Madhu, Syamaprasad, T.K. Rajeev Kumar, B. Unnikrishnan, Blessy, M.A. Nishad, Nemom Pushparaj, Priyanandanan and Lenin Rajendran and actors Sreenivasan, Manoj K. Jayan, Sreekumar, Poojappura Ravi, Kochu Preman, Saikumar, M.R. Gopakumar and Maniyanpilla Raju reached the Senate Hall to pay their tributes. Speaker K. Radhakrishnan and host of political leaders, including Opposition Leader Oommen Chandy, KPCC president Ramesh Chennithala, Congress (S) president Kadannappally Ramachandran, BJP state president P.K. Krishnadas and Kerala Congress chairman P.J. Joseph also paid their tributes. Chalachitra Academy Chairman K.R. Mohanan, V. Sivankutty MLA, Mayor C. Jayan Babu and City Police Commissioner M.R. Ajith Kumar led the arrangements at the venue. Murali had abhorred tears. Flowers he had not loved. And, sloganeering was taboo as he firmly believed in action, not speeches.